31/52 Les Winan Witty and clever but missing some of the depth that would have kept a better movie going. 44/68 Michael Bentley Tries to be like an animated cross of The Goonies and The 'Burbs - that's a good thing. But the story turned rather boring and unexciting. 54/65 Kim Hollis It's way too scary for kids in the beginning, and just dull the rest of the time. 82/200 Max Braden Fantastic animation and camera work. I couldn't get into the story on this one that much though. 127/159 David Mumpower Too macabre for kids and nowhere near entertaining enough for adults. That's a bad combination. Sadly, this movie isn’t actually a big screen adaptation of the marvelous construction show led by host Steve Watson; instead, it’s a CGI-animated family horror film. That’s right. A family horror film. The project is being done using the same “performance capture” animation that Robert Zemeckis originated in The Polar Express. While Zemeckis is not directing the film, his ImageMovers production company will be working behind the scenes on the project. Additionally, Steven Spielberg is an executive producer. The movie centers around three kids - D.J. Harvard and his two friends Chowder and Jenny - who discover that a neighbor’s house is actually a leaving, breathing monster with very malevolent intentions. The problem for them is that even though they try to warn the adults about the potential impending doom, none of them believe the kids. It’s up to our three heroes to find a way to destroy the home before it devours a pack of innocent trick-or-treaters. 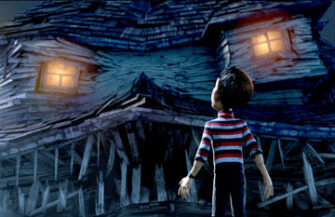 See the latest developments for this project on the Monster House Movie News page.